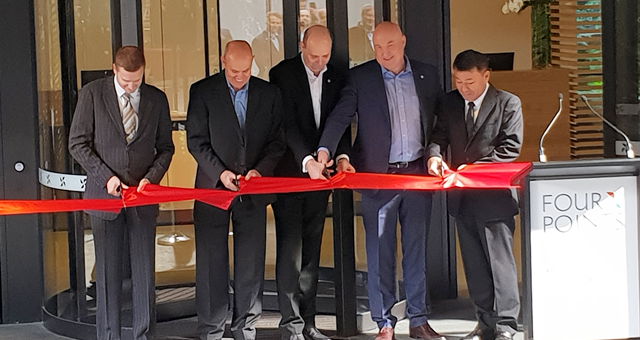 Marriott International Area Vice-President (second from right) Sean Hunt joins the ribbon cutting at Sydney’s new Four Points by Sheraton. Doors have officially been opened at Sydney’s newest hotel, the 297-room Four Points by Sheraton Sydney, Central Park, with ceremonies taking place today at the latest in Dr Jerry Schwartz’s glittering Australian portfolio. “Sydney is crying out for new international accommodation, but the Four Points will be the only international hotel to open in the CBD this year. It will be my first hotel managed by Marriott, so we are expecting the power of their global sales, marketing and loyalty channels to make the hotel a major success,” Dr Schwartz said. 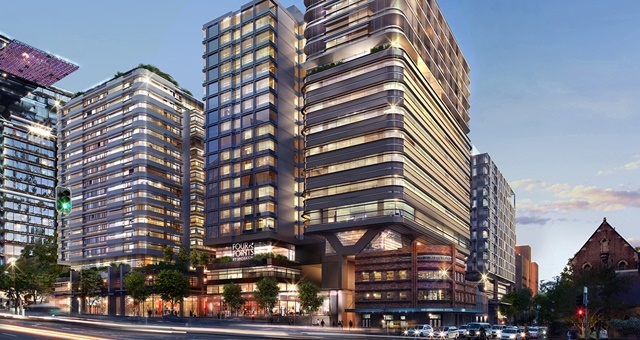 In what will be the only international hotel scheduled to open in Sydney this year, today’s festivities mark a return to the NSW capital for the Marriott International brand following a brief departure from what now operates as the Hyatt Regency Sydney. A rendering of the newly opened Four Points by Sheraton Sydney, Central Park. The new Four Points by Sheraton Sydney, Central Park was designed by British firm Foster + Partners and developed by Frasers Hospitality and Sekisui House. It resides deep within a massive state government urban regeneration project on the historic Broadway strip just west of Central Railway Station. Public facilities include two bars and restaurants, a fitness centre and 550 square metres of function space. The new Four Points will officially join the portfolio from 08 October at a charity gala hosted by Dr Schwartz. “With Central Park now almost complete and with the benefit of extensive transport options at its front door, I think this precinct offers outstanding potential,” said Dr Schwartz.